That is so awesome! I love the composition. The angle/pose of Leatherhead creates this really cool swirl shape, and the lighting/shading makes this feel sinister. That picture is amazing, I'm loving the stance leatherhead's in and also the detail. Very cool. 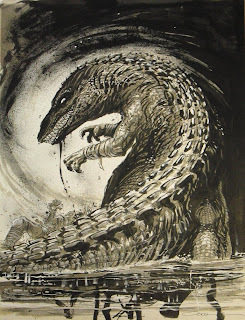 Reminds me of some of the Leatherhead pinups from Tales Vol. 1. -->> .. err i mean Tales V. 1 .. sorry, Chad. -->> **CHAD, this IS the pin up from Tales V. :D ..
*** among another of Steve's takes on the ol' Gator. Oh, yeah, you're right, tOkKa. Silly me.